Welcome to Athena. 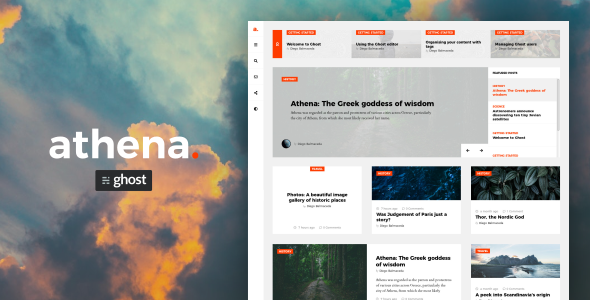 A modern, powerful and multipurpose Ghost Template with Masonry Layout that suits medium-big blogs and magazines. Tweaked: Eliminated scrollbars on carousel and vertical navigation bar. Fixed: Masonry grid layout spacing issue. Fixed: Image Galleries not preserving image proportions. Added: French translation (Thanks to ASX31). Fixed: Infinite Scroll was only displaying one post on each request. Fixed: Search Functionality was broken due to new Content API. Now, it requires users to generate an API key in order to use it (Check documentation). This update is necessary only for people using Ghost version 2.10.2 or newer and the new Ghost’s API. Added: Support for Content API v2. Updated: Installation instructions on documentation files. Added: New background pattern for Dark version. Tweaked: Collapsables now activate by click and not by a hover event. Fixed: GScan warning. Theme is now 100% valid. Fixed: Error page not loading assets and scripts. Fixed: Color and Alignment Issues.